Invest Smarter! Join Conrad’s Utility Investor! 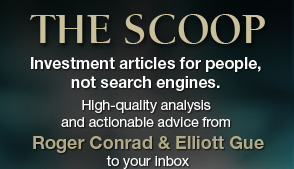 What sets renowned income-investing expert Roger Conrad apart from the pretenders? 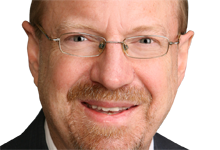 His more than two decades of covering utility stocks and essential services—a wealth of knowledge and experience that you can’t find anywhere else. Smart investing. Taking advantage of real opportunities and not fads (and knowing the difference). Finding the companies and stocks that will deliver for the long haul, so investing lets you live instead of investing turning into your life. 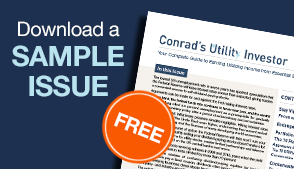 Roger Conrad has dedicated his career to these principles—and that’s what Conrad's Utility Investor delivers. Subscribe today for instant access to a treasure trove of investment insight and knowledge, as well as Roger’s exclusive model Portfolios and ratings of more than 200 essential services.